In a time of apps, websites and automation, connecting in-person can seem like a thing of the past. But for job-seeking refugees, it can be the key to their success. For refugees, the challenge of finding employment seems daunting. How does job-seeking work in this new country? Where does a newcomer even begin? What are employers looking for? For employers, the challenge is equally complex: not knowing how to assess refugee education, work experience or skills can mean missing out on talent and opportunity. Bridging these gaps is critical, but their success only comes because of the power of local partnerships. Starting small, but already spreading across the country, We Link Sweden’s Entry Hub project is playing an important role as a broker between refugee job seekers and the companies that want to hire them. 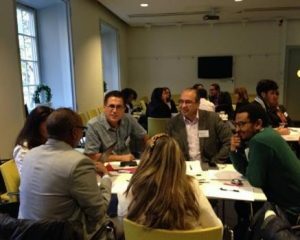 In part inspired by the Canadian approach to refugee integration, where civil society actors help newcomers find work, We Link Sweden applied for a VINNOVA (Swedish Ministry of Enterprise and Innovation) innovation grant in 2015. Their approach emphasized the direct involvement of refugees in identifying needs and creating solutions. We Link Sweden’s Hugo Ortíz Dubón says they saw each refugee as a person with potential. We Link Sweden sees each person as active and capable, with human and social capital to offer. The organization wanted to encourage and push refugees to actively take part in their own integration. Out of this work, Entry Hub was born. Focused not only on immediate employment needs, Entry Hub supports individual refugee job-seekers to prepare for long term employment success in the Swedish labour market. With additional financial support from VINNOVA, they began to implement their model through pilot initiatives with specific employer partners. Swedavia, the Swedish airport authority, was eager to participate. They had a genuine interest in supporting newcomer integration, and positions to fill. With Swedavia providing the airport as a physical location, We Link Sweden hosted its first networking day, connecting newcomers with Swedavia staff who could provide information about job vacancies, and the Swedish labour market generally. Newcomers reported feeling more included in the employment process: they were able to showcase their competencies in-person, and determine where their skills intersected with the existing jobs. Dubón says that the experience also broke down barriers between newcomers and Swedes. Swedish workers discovered links they had with newcomers and felt more connected and open to them. While the initial pilot did not result in jobs for refugees, it secured Swedavia as a key corporate partner in the Entry Hub initiative. As it expands, Swedavia is interested in exploring ways to hire from Entry Hub’s newcomer pool at the Umeå Airport. Entry Hub’s next foray into corporate partnership proved more fruitful after learning from its pilot. We Link Sweden was excited to create a similar event with PostNord, Scandinavia’s biggest postal company. PostNord expressed interest in hiring part-time workers in early 2017 and partnered with We Link Sweden to hold a recruitment event. Given the specific needs of the employer, We Link Sweden decided to pre-filter job candidates using tools such as online psychometric self-assessments. This narrowed the pool of candidates to 25 newcomers who attended the event. Dubón says this approach was important: the self-assessment allowed newcomers to determine attendance based on their own assessment, evaluation of job requirements and interest in the work. This proved to be a successful method to ensure the employer received well-suited candidates: all 25 were offered interviews, with 20 of them deciding to participate. All were hired at PostNord. We Link Sweden doesn’t stop at connecting job-seeker to employer. Their model incorporates continued monitoring and evaluation to ensure new hires’ workplace experience is positive. Of the 20 new hires, 18 remained with PostNord in the same position, while the other two quickly moved into other positions within the company. Beyond workplace experience, We Link Sweden wants to ensure that the refugees continue improving their Swedish language competency. Given that the refugees were hired on a part-time basis, they were able to continue their language studies; the combination of work and language training significantly increased their Swedish language ability. In a country where language acquisition has been a significant barrier, Dubón says that the combination of work and study is crucial and effective in providing newcomers with more opportunities to practice and become proficient in Swedish. These early successes made the Entry Hub model a viable solution for employers and refugees alike in Sweden. It wasn’t long before company requests started coming in. We Link Sweden opened their first physical Entry Hub location in Umeå in October 2017. Another will open in the Stockholm suburb of Botkyark in early 2018. Opening a physical location for Entry Hub provides a space for newcomers and employers to meet. It’s also a place where newcomers can quickly learn what they need to know about the job market, from workplace rights to workplace culture, and how to match their skills with existing opportunities. In Umeå, collaboration with local partners happened rapidly. After only a few weeks from opening, ten people were hired by local small businesses in different sectors through the Entry Hub. Nine were newcomers/refugees, including three asylum seekers, the most difficult group to employ. Asylum seekers whose cases have not yet been determined in Sweden have permission to apply for jobs. However, it can be a risk for an employer. If the claim is rejected, asylum seekers will have to leave Sweden and the company loses their employees as a result. However, if asylum seekers can obtain jobs, this can also positively impact their case. In the Botkyark suburb of Stockholm, the Entry Hub will hit the ground running with two companies that want to hire close to 50 newcomers. Dubón says an Entry Hub model can be set up and active within three months in any city, in any country. His recipe for success is simple: map everyone’s needs, develop custom solutions to meet those needs and coordinate everyone. According to Dubón, once you know your stakeholders and create solutions that meets their needs, it becomes easy to put everything into practice quickly. The Entry Hub model has illustrated the importance of local hands-on collaboration and building a physical space where newcomers and employers can interact directly. It has also shown how building on a human capital, not deficiency, model is essential when working with refugees. Other cities and Scandinavian countries agree. There is much interest to expand the Entry Hub model across Sweden. Norway and Denmark are following the model closely. Take the time to identify existing challenges. Bring people together, including refugees themselves to brainstorm solutions. Inter- and intra-sectoral collaboration is important to meet the unique needs of refugees and local communities. Especially when integration has been difficult or refugees are new to a city or employers, no one group can do everything. Work in a collaborative approach that brings together all stakeholders working on refugee employment, including employers. By identifying challenges to refugee employment, new ideas and initiatives can be created. Digital is important, but in-person, local solutions are needed as well. Look for gaps and opportunities in local settings. An external solution proven elsewhere can be replicated locally as long as it is inherently flexible and open to adapting to local realities and challenges.